The hotel combines the height of service and quality with a razor-edge approach, immersing guests in a location, and forming a deep connection with their cultures and people. 16m high ceiling lobby with a LED screen projecting unique art pieces or themes for an immediate "wow" effect. Exciting space for DJs and live performances, making it the new social center of Pudong. 405 modern room and suites, guests may access the internet wired or wirelessly on their computer or via high defination IPTV with a wireless keyboard. Thoughtful Chinese touches complete the interiors, such as the traditional tea table that forms the centrepiece or each room. High-tech gym with kineses exercise room, hot yoga studio and relaxation area with hot stone bath, ice, fire and steam rooms. 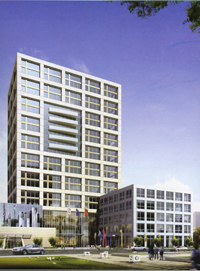 Located in Kangqiao, Shanghai, Shanghai Leisure-hotel, abutted against Wanda Plaza in Zhoupu, is a high-quality, modernized and rating of four-starts International Business Hotel. It enjoys convenient transport lines and only 20 minute riding from the New International Expo Center to our hotel, 30 minute from Pudong International Airport. There are 164 sets of rooms specially designed for the business guests, in which are facilitated with IDD/DDD, IPTV and free charge of Broadband International Access. Business Centre, Multi-function Meeting Room, Banquet Hall, Teahouse, Toot-massage, Chess rooms and other comprehensive services are offered by our hotel. Every guest at home and aboard will meet our bright smile, warm heart and friendly services on your arrival. Our services will make all gusts have the feelings of home in our hotel. Opened business in 2007, the hotel is located on West Gaoke Road in Pudong New Area of Shanghai, with Zhangjiang High-Tech Park on the east and the maglev train on the north. It offers guestrooms and suites of different sizes, good catering and recreation facilities, conference rooms and a banquet hall. 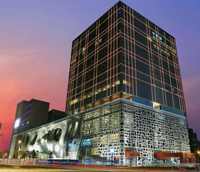 Featured with bold contemporary style, the hotel is strategically located with easy access to the Shanghai New International Expo Center, Lujiazui Finance & Trade Zone, and the Century Park. Hotel is within walking distance to Century Park, the largest parkland in Shanghai and nearby a number of 18 hole golf courses in Shanghai. With 362 well appointed guest rooms, the hotel provides a good selection of dining outlets such as Chinese restaurant, Italian restaurant, all-day dinning cafe and lobby lounge. Complimentary unlimited broadband internet access in all rooms and suites.